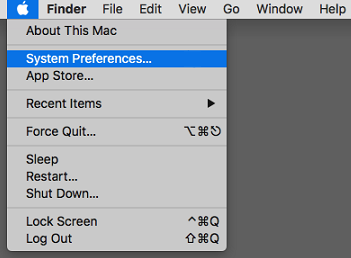 Please select the version of your product you are using to back up your files on your Mac. If you are unsure about your version, please determine your Carbonite version before following the instructions below. Viewing a file's status through the Carbonite Preferences pane is the best method. Within the Backup tab all your files are able to be seen with colored status dots indicating their backup status. 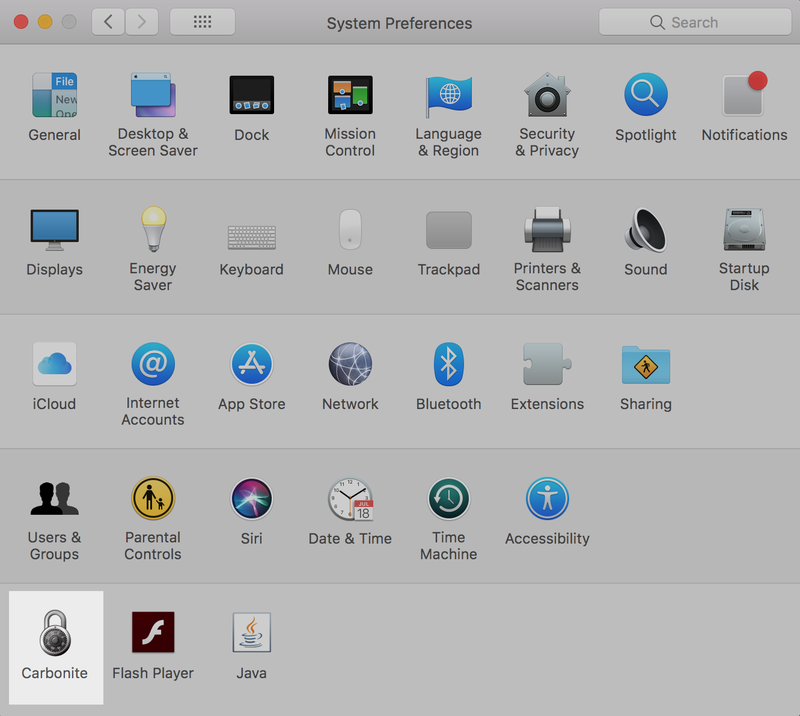 You will see the Carbonite Preferences pane displayed. Click the BackupA set of copies of your files on our servers. button to view your backed up files. 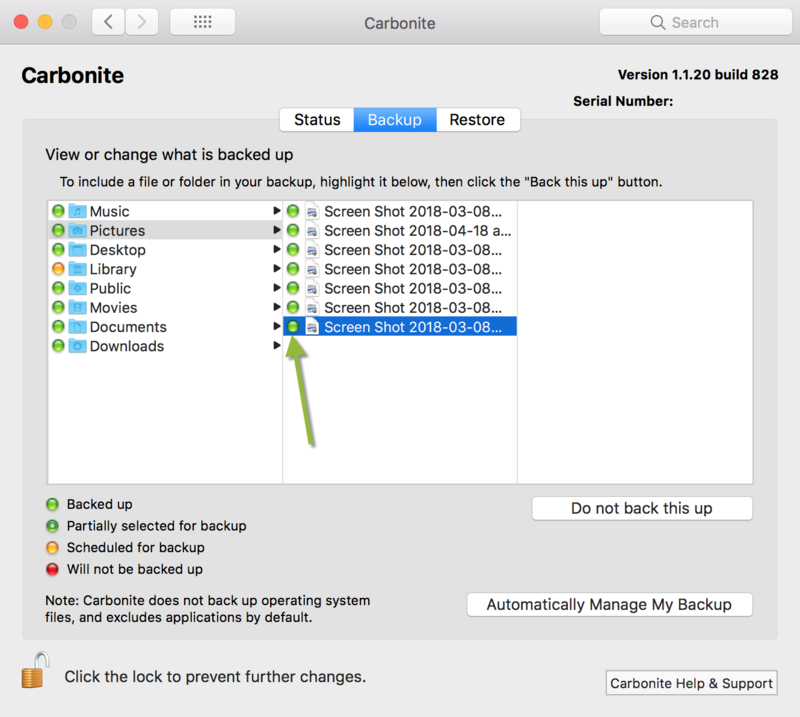 If you do not see a screen similar to the one below, click the Manually Manage My Backup button within the Carbonite Preferences pane to view your backed up files. Here, you will see all the files and folders in your computer with dots on them indicating the status of their backup. A green dot on a file indicates that the file has been backed up. A yellow dot on a file indicates that the file is selected for back up, but back up is pending (has not yet completed). A green dot on a folder indicates that all of the folder's contents have been backed up. A green donut on a folder indicates that some of the folder's contents have been backed up, but some files and/or sub-folders are not selected for back up. A yellow dot on a folder indicates that the folder contains files or sub-folders that have been selected for back up, but back up is pending (has not yet completed). A red dot on a file or folder indicates that it is not selected for back up. 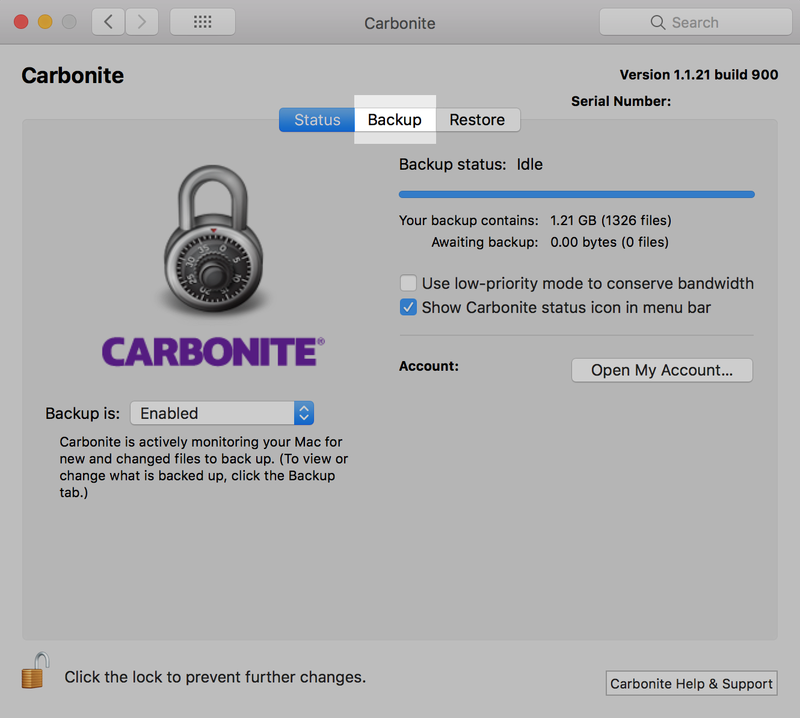 If you are running Carbonite version 2.x, you will be viewing the status of your files through the Carbonite User Interface. You can see all your files with colored backup status indicator dots within the MY FILES or DRIVES section. 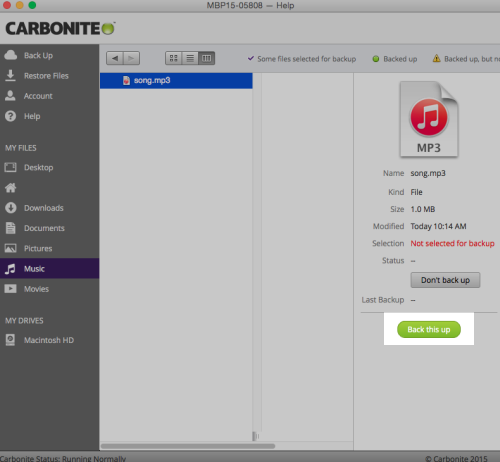 Within the Carbonite User Interface, click on a location within the MY FILES or DRIVES sections and you will see a status icon on your files and folders. You will see all the files and folders in your computer with dots on them indicating the status of their backup as well as view some details about the file such as the name, size and last backed up date. A yellow/orange dot with 'clock hands' on a file indicates that the file is selected for back up, but back up is pending (has not yet completed). A purple checkmark on a folder indicates that the folder has been selected for backup. A yellow caution icon with an exclamation point on a file indicates that the file was deleted from the computer, but is still recoverable by Carbonite.